We are pleased to announce that Operation Hathor has been approved! This is a joint Operation between D&C Wildlife CrimesGroup and the RSPB Chough Project that will afford our Cornish Choughs some official police recognition. The Cornish Chough Project have been instrumental in ensuring the safeguarding of nest sites in Cornwall and the flagship Lizard Point site has been a huge visitor attraction for the past 11 years. 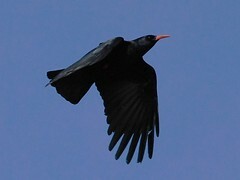 With 7 pairs of Chough nesting this year, Operation Hathor will aim to collate and centralise information and intelligence from each site and act on any information regarding unusual activity or behavior at the sites.